Of course, all these old traders’ tales aren’t necessarily all true as with most things that concern the markets. The markets are forever unpredictable and no rules of thumb or any other finger ever works. It’s different every time although sometimes we can see how it rhymes. Let’s take a look at what transpired in 2018 and hopefully we can learn some lessons for 2019. This was the biggest thing in 2018 that brought the decade long bull market to its end. US decided to impose tariffs on USD200bn worth of goods traded and China retaliated with tariffs on USD60bn worth of goods. But since China exported much more to the US, she was the natural loser here. Her stock market collapsed 25% and the US followed, so they decided to patch. The two countries set a truce until 1 March 2019 when hopefully some good news would be announced. 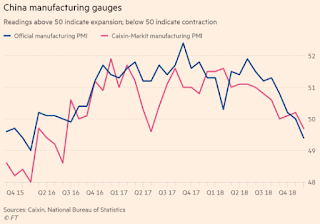 Meanwhile, China’s economy continue to slow as the PMI above showed how things had really rolled over. The US is not doing that great as well with Fed’s tightening impact reverberating across the system. Global bank stocks fell a good 15-20%. So with the two largest economies in the world slowing down, how can we expect a good 2019? Well, we better get ready for a roller coaster downride! Last year this time we talked about a tech melt-up. It didn’t melt-up, it melted down. FAANG and BAT * collapsed after their stellar performances from 2015-2017. Apple cracked another 7% last night after iPhone sales disappointed. Google collapsed 30% and now looks really interesting as it generates USD33bn in Free Cashflow (FCF) on an Enterprise Value of c.USD600bn. In China, Alibaba and Tencent also underperformed massively. But I am not a big fan as valuations are still not cheap despite falling 30-40%. Not forgetting the mega-proxy for new gen tech – Bitcoin. It peaked at USD19,650 around Dec 2017 and fell all the way to USD3,875 as of yesterday. 95% of all initial coin offerings went underwater and many investors lost their shirts. While blockchain technology will change the future, it’s decades before we see things coming to fruition. This is very analogous to how Google and Amazon came about in the early 2000s only to make an impact today. Who knows, maybe at some stage, we should own some Bitcoin. It might become the new gold standard. As the rage went on and then off in the internet and new gen tech space, a large list of brick-and-mortar forgotten stocks got really cheap. Again this is just like what happened during the first dotcom bubble. Automakers are trading at single digit PE and some over 10% FCF yield. Consumer staples are now back to mid teens, some are even at single digit PE. In Singapore, stocks like Overseas Education (discussed previously in 2016) is trading at 13% FCF and giving out 8% dividend annually. Albeit it’s micro-cap and hence there’s always inherent idiosyncractic risks. 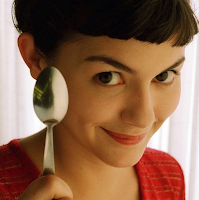 Forgotten stocks are like forgotten actresses (one of my favourite being Audrey Tautou in Amelie featured above). They continue to do their work but after the limelight shone away, they grow out of sight and out of mind. Some do make spectacular comeback but most find a rich husband and get married much like cheap stocks getting taken out at a premium. There is money to be made buying forgotten stocks, but it also requires a different approach i.e. having a diversified portfolio capable of capturing some of these gains but also capable of waiting things out (much like Overseas Education which had done nothing over the last three years). Buying some of these forgotten names do require stringent long term buy-and-hold strategy to make money. 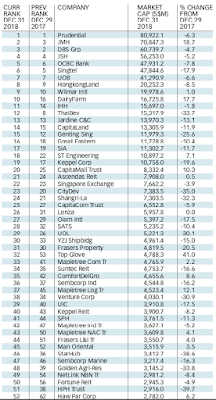 If we scrutinize the 5 year performance of the top 50 names by mkt cap in Singapore (list below courtesy of Business Times), we would come to the conclusion that buy-and-hold didn’t work. The largest company in Singapore (Singtel) fell c.18% last year and is now overtaken by two banks and a trading conglomerate. Across the board, most Singapore co.s did badly over 1, 3 and 5 years as our economy matured. In fact, buy-and-hold had not worked for most Asian markets starting with Japan in 1989. So again, we come back to the notion that no one rule ever works all the time. Buy-and-hold might make sense for some stocks, usually in the US or the European markets. Even so, as internet businesses grow and economies change, it is increasing difficult to hold many of the same stocks for 10 years expecting them to compound. Some would, but most wouldn’t. This is also reflective of today’s disruptive cycles where new businesses make old ones irrelevant quicker than before. A few decades ago, a successful retail model like Walmart had a good 10, 15, 20 year runway to conquer US and then the world. But today, Whole Foods would be taken out by Amazon, Ford had its lunch eaten by Tesla and Zynga Games and Angry Birds disrupted Electronic Arts only to see itself getting disrupted by Supercell and others in a short span of a few years. Hence, I think the value investors of our age would need to rethink buy-and-hold. If necessary, we have to use valuations to guide us to ride the wave. When we find good businesses at reasonable valuations, we should ride on and exit when valuations are exorbitant. 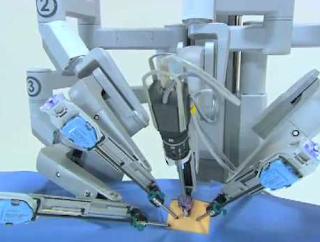 One example that comes to mind is Intuitive Surgical (ISRG) – the company behind the surgical robot now commonly used for prostate removal. In 2016, ISRG was trading at a reasonable 4% FCF yield (FCF USD1bn over market cap of USD25bn). It surged to 1.5% FCF in mid 2018 (when buy and hold didn’t make sense anymore) and now corrected c.20% from its peak. At some point, it might become interesting again, say FCF USD2bn at market cap of USD45bn or c.16% from today’s price. Hopefully that gives a flavour of how how copy trade works tips web site would be going forward. So, in the new era, buy-and-hold no longer means buy and hold for 10 years and we constantly have to keep a lookout for disruptions. When valuations doesn’t make sense, we also have to trade. As for 2019, the wave had collapsed and we need to be vigilant. There shouldn’t be a 2009 Lehman type of meltdown but things should get uglier before it gets better. Meanwhile, we keep our gunpowder dry and look for those high single digit FCF stocks to buy. Maybe some forgotten stocks and forgotten actresses will come back in vogue. My picks are as discussed: Google, Intuitive Surgical and Overseas Education (which I already owned). Happy New Year and Huat Ah! Previous Previous post: Did Bitcoin Miss Its Moment In U.S. Betting?